Sally McGuire Muspratt holds a Graduate Certificate in Landscape Design from Radcliffe College (1993), a certificate in Landscape Maintenance from UMass Extension (2002), an M.A. from Newnham College, Cambridge and a BA from Harvard. In 2010 she was accredited as an Organic Land Care Professional by the Northeast Organic Farming Association, and in 2011 as a Professional Landscape Designer by the APLD, the Association of Professional Landscape Designers (certification #344). Sally gardens in West Roxbury, MA and La Malbaie, Quebec. Sally serves on the Board of the Arboretum Park Conservancy. In the past she has served as a Park Overseer and member ofthe Kelleher Rose Garden Advisory Committee of the Emerald Necklace Conservancy. She is past President of the Board of Cogdesign, past Chairman of the Landscape Design Study Classes , the Landscape Design Council of the National Council of State Garden Clubs, and the Civic Development Committee for the GCF of MA. Sally consults on civic plantings, designs residential and public gardens, lectures, and writes. In 2001 Roslindale Gardens received the Mass Horticultural Society Award for Urban Design for Sally’s design and installation. In May 2005, she won the Presidential Citation from the Garden Club Federation of Massachusetts for creation of four workshops exploring problems clubs encountered in public landscaping, as well as National Garden Clubs Award #68 for Videos of Workshops. In May 2006, West Roxbury Main Streets recognized her as West Roxbury Main Streets Volunteer of the Year for her public improvement work on Centre Street. 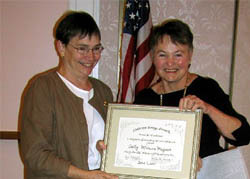 At the annual meeting of the Garden Club Federation of Massachusetts in 2007, Joan W. Schofield, past chairman of the Landscape Design Council, presented the Landscape Design Council Award for Excellence in recognition of outstanding civic accomplishment to Sally Muspratt. In June 2017 she received a Lifetime Award from the Garden Club Federation of Massachusetts for her many years of service creating civic development workshops.